Feb. 5 — The United Nations' climate change negotiations in Paris may be 2015's environmental cause celebre, but Rolph Payet wants the world to remember that toxic chemicals should be a front-burner topic in Geneva. “Chemicals and waste are also very important,” said Payet, the new executive secretary of the Basel, Rotterdam and Stockholm (BRS) Conventions. “If we don't manage them properly, they can affect the environment in more or less greater ways than climate change,” he told Bloomberg BNA during a recent interview in Geneva. During Payet's first four months in office, the former Seychelles minister for environment and energy has been hard at work preparing chemical stakeholders for what he hopes will be a momentous year. Specifically, he is seeking to establish firm guidelines for the management of electronic waste and mercury, adopt a new chemicals and waste compliance mechanism and list several toxins at the May 4–15 BRS conference of parties (COPs) in Geneva. The issue most at stake at the 2015 BRS COPs is the successful adoption of a compliance mechanism to increase transparency and enforcement of international chemicals and waste management, Payet said. In May, parties to the Stockholm and Rotterdam Conventions will consider rules to ensure that countries are applying the relevant management and customs procedures for chemicals that are listed as harmful to human health and the environment. The Rotterdam Convention requires countries that export restricted chemicals to adequately notify the receiving country. The Stockholm Convention requires parties to prohibit the production, use and trade of certain persistent organic pollutants. Payet said he hopes parties to the Basel Convention—which defines limits on the cross-border movement of hazardous waste and its disposal—will adopt clear guidelines on how to deal with the hazardous and costly effects of electronic waste, or e-waste. E-waste from discarded mobile devices and computer equipment is considered hazardous due to the presence of toxic materials such as mercury, cadmium, asbestos and lead. “Televisions, computers and mobile devices contain a range of hazardous substances,” Payet said. “When they end up as e-waste—for example in the landfill—they will leach out into the environment and create problems. “Ten years from now we don't want to look back and say we wish we could have done something more about it,” he said. Last year, the United Nations issued its latest draft technical guidelines on the transboundary movements of e-waste. The guidelines seek to establish the difference between hazardous and non-hazardous e-waste, provide guidance on the transboundary movements of e-waste and offer inspection guidelines for enforcement officials to control the transportation of e-waste. 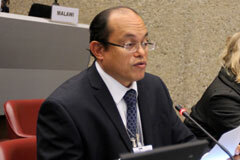 Payet said he is equally optimistic that parties will adopt the draft technical guidelines for the environmentally sound management of mercury waste in 2016. Payet said he plans to work closely with members of the chemicals industry to help prepare them for the listing of new chemicals. “I encourage industry to monitor closely which chemicals are being discussed, and which chemicals the science is showing are toxic, with a view to developing a strategy for slowly phasing out harmful chemicals and addressing some of the challenges,” he said. Payet said he's optimistic the Rotterdam Convention COP will list paraquat dichloride formulation, an herbicide considered toxic to humans and animals, during its May meetings. Payet said he hopes parties will support alternatives to the use of dichlorodiphenyltrichloroethane (DDT) in countries that depend on it for controlling the spread of malaria. In May, the Stockholm Convention COP will review measures to reduce or eliminate releases from intentional production and use of DDT. The UN's draft technical guidelines on the transboundary movements of e-waste are available at http://bit.ly/1Ax48Mm. Draft technical guidelines for the environmentally sound management of mercury waste are available at http://bit.ly/1v2tzyk.